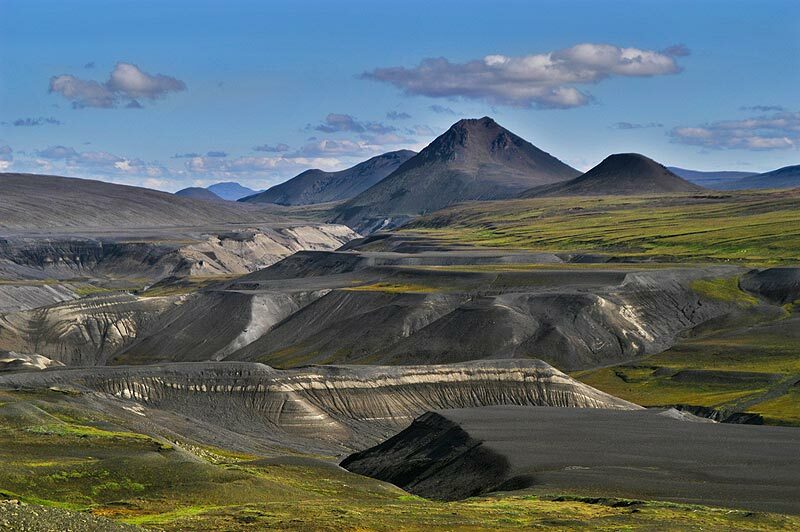 North of Vatnajokull, Europe’s biggest glacier, lies Iceland’s most fascinating and varied volcanic landscape. Ice and boiling geothermal infernos meet at the edges of the glacier, and then the largest remaining pristine wilderness in western Europe begins – a vast panorama of wild rivers, waterfalls, brooding mountains and mossy highlands thick with flowers. A large part of this is due to disappear under 150m of water by 2006, when the Karahnjukar dam is completed. Work has already begun on the $1bn mega-project designed to power just one aluminium smelter, to be built by US multinational Alcoa. Environmentalists in Iceland and abroad have looked on in disbelief as the project has proceeded, sidestepping one obstacle after another, driven by a government seemingly determined to push it through, whatever the cost to nature or the economy. 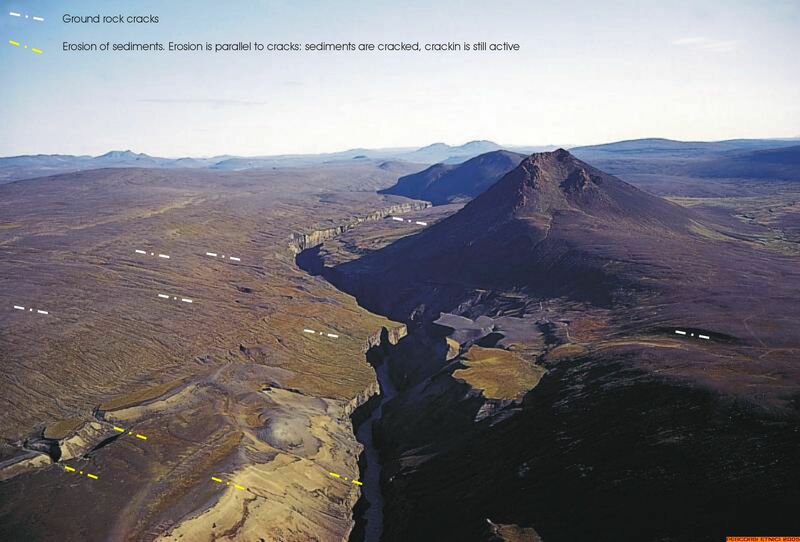 The 190m high, 730m wide main dam, two smaller saddle dams and 53km of headrace tunnels will be paid for by Landsvirkjun (the national power company, owned jointly by the Icelandic government, the city of Reykjavik and the town of Akureyri). The main dam will create a huge reservoir, to be called Halslon, which will inundate a 57sq km swathe of the highlands to the south before running on to the glacier itself. The resulting hydroelectricity is contracted for sale for 50 years to Alcoa, which is closing two smelters in the US and relocating to Iceland as a cost-cutting measure. In August 2001, Iceland’s National Planning Agency (NPA) rejected the project on the grounds of “substantial, irreversible negative environmental impact” – of 120 hydropower projects submitted for approval, Karahnjukar is the only one it has opposed. Just four months later, that decision was overturned by minister for the environment Siv Fridleifsdottir, in a move that prompted a series of lawsuits and raised concern about the nature of democracy in Iceland. Earlier this year, lawyer Atli Gislasson and a group of 26 citizens brought separate cases before the Icelandic high court and European Free Trade Association surveillance authority, challenging the government’s lack of transparency and Fridleifsdottir’s decision; both cases are expected to be heard next month. Heading south from the site, the first part of our walk took us past Saudarfoss, a breathtaking terraced waterfall, one of 60 that will be lost. Last month, a farmer discovered remains nearby of a farm where much of the action in Hrafnkel’s Saga, one of the classics of Icelandic literature, took place; archaeologists heralded this as a very significant find. Crystal-clear waters tumbled into the grey silty torrent of Jokulsa a Dal, the glacial river that will power the main dam, and from there one of the largest continuously vegetated areas in the highlands begins. It was difficult to walk on the deep, springy mattress of moss, grass and flowers, and the spot is so inaccessible that few have been lucky enough to do so. This is one of the main breeding grounds for the area’s reindeer – according to Skuli Sveinsson, a tracker, a cull of one third of the population has already begun in anticipation of the drastic reduction in feeding grounds. Thousands of pink-footed geese graze these uplands, a protected nesting ground. It is also a favourite haunt of the snowy owl, ptarmigan and the majestic gyrfalcon. Blood-red rocky gorges, vivid as raw steak, give way to barren black sediment ledges. Moulded by glacial movement and sensitive to atmospheric changes, the formations are a record of 10,000 years of geological and climatic change. Unique in the world, they are of immense interest to scientists studying, among other things, global warming. Specialists fear there is not time to unlock even some of their secrets. Passing rapids of unimaginable violence, we find the imposing stone head, sculpted by nature, which has become a symbol of resistance to the dam project; its image was this summer’s top-selling postcard. The environmental impact of the project is by no means confined to the future shores of Halslon, nor to unpopulated areas. In summer, when the water is low, strong eastern winds will whip up dried silt at the edge of the reservoir, blowing dust storms over the highlands towards farms further east. The hydro-project will also divert Jokulsa a Dal at the main dam, hurtling the river through tunnels into the slow-moving Jokulsa i Fljotsdal, which feeds Iceland’s longest lake, Lagarfljot. The calm, silver surface of this tourist attraction will become muddy, turbulent and unnavigable. In the Herardsfloi delta, home to a significant seal population, heavy silt deposits from Jokulsa a Dal currently prevent the sea from encroaching on the land. Once the silt is trapped by the new dam, fields will be flooded and two established farms – one an eco-tourism centre – almost certainly destroyed. The most alarming development for conservationists, however, is the violation of an officially protected area. One third of Kringilsarrani at the foot of the glacier will be submerged. In a radio interview in August, Siv Fridleifsdottir said that, in her view, “protected” did not mean “for ever protected”. Fridrik Sophusson, Landsvirkjun’s managing director, supports her decision, and tells me the government “has the right to change such a human decision”. There have been some grand gestures by individuals: this summer, poet and activist Elisabet Jokulsdottir grabbed the microphone during a domestic flight over Karahnjukar, giving passengers an impassioned lecture on the dam project. But there is a lack of cohesion and strategy when it comes to wider protest. A small grassroots movement has regular “speak-outs” and demonstrations in Reykjavik, drawing up to 1,000 people, but Icelanders are gentle and peace-loving (Iceland has no military). Its protesters would struggle to orchestrate the kind of action and concentrated opposition that halted construction of the Santa Isabel dam in Brazil. While much of the developed world is busy dismantling dams, transplanting its heavy industry base to the developing world, the people who govern Iceland hold fast to their dreams of an industrialised nation. David Oddsson, the prime minister and leader of the Independence party, has been in power for 12 years and is revered, feared and hated in equal measure. With Halldor Asgrimsson, leader of the Progressive party, he heads the ruling rightwing coalition. The opposition comprises a centre-left coalition with 20 seats, five Left-Greens and four Liberals. Fridrik Sophusson, a former minister of finance in Oddsson’s cabinet and now Landsvirkjun’s managing director, clearly shares the ruling elite’s appetite for mega-projects. Now 60, he recalls the days when Iceland was impoverished and patronisingly known throughout Scandinavia as “little Iceland”. Today, it is one of the most affluent nations in the world, having exploited its natural resources, mainly fish, and Sophusson reasons that hydropower is a logical step towards economic diversification. He dismisses conservationists as “romantic”. Iceland’s neighbours are not impressed: lamenting its “democracy deficit”, the Swedish Gothenburg Post recently described Iceland as “a pariah among Nordic nations” for its disastrous environmental policy, which it called “war against the land”. The government’s utilitarian attitude would make more sense if the dam project was in any sense viable. Its rationale is that the dam and smelter will revitalise the local economy by creating jobs in the eastern fjords and reversing the current depopulation trend. But the area has little unemployment, and few Icelandic youngsters would be tempted by the harsh conditions of the highland construction site or one of Alcoa’s 400 or so jobs. The two existing smelters in Iceland have been obliged to import cheap foreign labour from eastern Europe. The environmental damage caused by both smelter and dam looks set to prompt a further exodus. Aluminium smelters emit enormous quantities of greenhouse gases. In 2001, super-clean Iceland was able to negotiate a 10% increase in permitted emissions under the Kyoto protocol – the biggest increase in the world. In effect, Alcoa is buying Iceland’s licence to pollute, as well as cheap electricity. The ministry of environment also gave Alcoa a licence to emit 12kg of sulphur dioxide (SO2) per tonne of aluminium produced – 12 times the level the World Bank expects from modern smelters. SO2; and fluoride, the most dangerous pollutants in terms of public health and land damage, will be pumped directly into the air via giant chimneys. Local opposition is limited. Gudmundur Beck, 53, is the lone voice of resistance in Reydarfjordur, the eastern fjord where the Alcoa smelter is to be built. He has lived in the fjord all his life, but his farm will be decommissioned once the smelter opens in 2007. He believes that local people have been won over by a concentrated spin campaign: “Landsvirkjun has spent millions of krona on PR in this area, particu larly on the radio.” Thuridur Haraldsdottir, a local sailor’s wife, is so enthusiastic that she has had her car number plate re-registered to read Alcoa. In 2001, the EU anti-corruption group Greco found that “the close links between the government and the business community [in Iceland] could generate opportunities for corruption”, and it is the closeness of these links that the government has had to watch. This summer the police launched an investigation into alleged price-fixing by a cartel of three oil companies, which is proving particularly embarrassing – the director general of Shell Iceland, one of the companies under investigation, is married to the government’s current Speaker (and a former minister for justice). The Independence party has necessarily close links with the domestic construction industry, which has benefited from most of the Karahnjukar subcontracts. But the biggest slice of the cake – $500m – has gone to Italian conglomerate Impregilo, which was awarded the construction contract in March and is itself facing allegations of corruption in Africa. Impregilo is currently embroiled in trials in Lesotho, where South African consultant Jacobus du Plooy has pleaded guilty to paying bribes of £225,000 to the Lesotho Highlands Water Project. A decision as to whether to prosecute Impregilo alone, or together with the two British firms also accused of corruption, has yet to be taken; all three deny that they knowingly paid bribes. Impregilo was one of the three principal firms contracted to the notorious Yacyreta dam project in Argentina, which overran its projected costs by billions and was subject to financial scandals throughout its construction. It was also part of the consortium planning to build the Ilusu dam in Turkey which, had it gone ahead, would have made 30,000 Kurds homeless and drowned the world historic site of Hasankeyf. When I asked Sophusson if he was aware of the corruption charges faced by Impregilo, he referred to an established culture of corruption in Africa and Asia as a “cost”. While he is not in a position to comment on Impregilo’s business practice, he was candid about Iceland’s past experiences. “Twenty years ago we had to bribe officials [in order to export] fish to Nigeria,” he said. “It was even stated on bank statements. It’s a cost we have to pay, and it’s much better to be without paying.” He was, however, quick to emphasise that “we are not taking money from Impregilo” – a question I had not asked. Impregilo was the only company to bid below the consultant’s estimate for the job, and substantially below its competitors in the final round. Asked about the procedures involved, Sophusson volunteered the information that, in the end, Impregilo’s was “the only serious bid remaining… and we were a little nervous about that”. He may have good reason to be nervous, too: Impregilo employs some of the best lawyers in Europe and has negotiated 1,100 exemptions in its contract – all of which are believed to leave Landsvirkjun liable. In Megaprojects And Risk, published earlier this year, the Danish economist Bent Flyvbjerg examined hundreds of multibillion-dollar mega-projects across five continents. 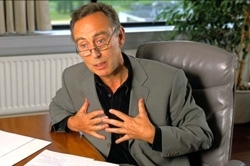 Promoters of mega-projects, Flyvberg and his co-authors write, characteristically “misinform parliaments, the public and the media in order to get projects approved and built”, with “the formula for approval an unhealthy cocktail of underestimated costs, overestimated revenues, undervalued environmental impacts and overvalued economic development effects”. 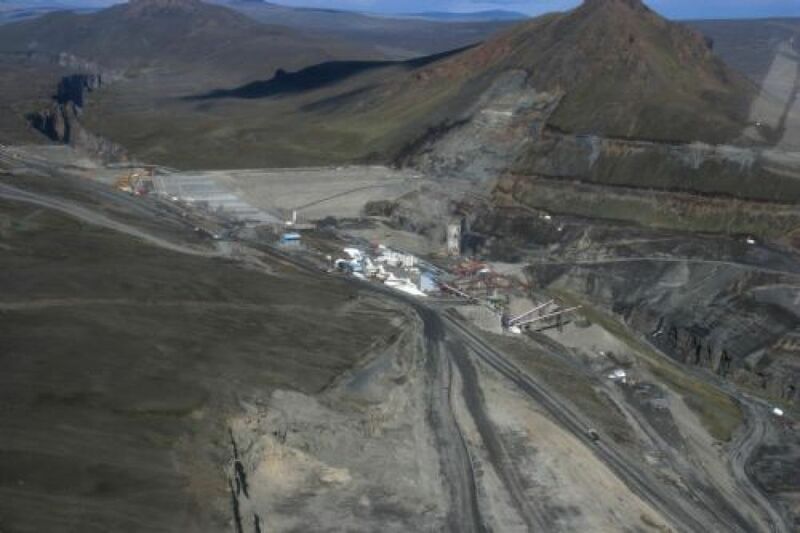 It is too early to say whether Karahnjukar qualifies as such a project but, according to Flyvbjerg, the financial ramifications of such projects can “hinder the economic viability of the country as a whole”. This is something that deeply concerns Thorsteinn Siglaugsson. “State-sponsored, unprofitable industries harm the economy in general,” he says. “That is why the USSR went bankrupt.” Siglaugsson fears that a boom during the construction period, with attendant high interest rates, will be followed by a recession. He knows of several Icelandic manufacturers who are already planning to relocate abroad. Polls show the nation to be more or less divided on the subject of Karahnjukar. But how well-informed are Icelanders? Many journalists speak of a media that is controlled both directly and indirectly by the state. In August, the BBC World Service lost its slot on Icelandic airwaves just as minke whale-hunting was resumed after a 14-year ban. Veteran broadcast journalist Omar Ragnarsson told me how he ran into trouble when he reported “both sides” of the Karahnjukar debate on national television – “There were calls for me to be fired.” In order to make a “rational” film about Karahnjukar, he has sold his flat and jeep to finance it independently. Dr Ragnhildur Sigurdarsdottir, a highly regarded environmental consultant, apparently fell foul of Landsvirkjun last autumn over a report she had been commissioned to write on the Thjorsa hydropower project (the report was commissioned by VSO, a consultancy contracted by Landsvirkjun). “I was asked to falsify my report to justify the larger-scale power plans Landsvirkjun wanted,” she maintains. “When I refused, it was altered anyway.” She went to the press with her story, and almost immediately, she says, found herself out of work. “All the jobs I had in the pipeline were cancelled overnight.” Landsvirkjun dismisses Sigurdarsdottir’s allegations as “unsubstantiated”. “She was unwilling to name the individuals she was accusing,” saysSophusson, adding that every employee who had contact with Sigurdarsdottir has “signed and published a declaration that these grave allegations were totally unfounded”. The “blue hand” is a slang term for the shadow of influence the Icelandic ruling elite (“the octopus”) casts over the individual. Myth or reality, it is an effective force, ensuring self-censorship and caution. Professor Gislason maintains that Sophusson has telephoned him on several occasions, asking him to reconsider his well-publicised opposition to various hydropower projects. The Icelandic Nature Conservation Agency, in association with the International Rivers Network, recently produced a highly informative brochure about Karahnjukar for which it commissioned several independent studies. The result was a coalition of 120 international NGOs – including WWF and Friends Of The Earth – actively campaigning against the project in June 2003. But the government seems to care little for world opinion, as its resumption of whaling demonstrates. Sophusson represents the view of many nationalistic, conservative Icelanders when he mimes squashing a bug under his shoe and says, “Nobody does this to Iceland.” Tourism is the fastest growing sector in the economy, the fishing industry the largest. Both stand to be significantly affected if Iceland and its products are boycotted as a means of global protest, as they were during the resumption of whaling in the 1980s. Already, the tourist board speaks of “hundreds, if not thousands” of potential cancellations as a direct result of the whaling controversy: 80% of tourists go to Iceland to experience what the government markets as “unspoilt nature”. In a sense, that nature is part of the world’s heritage and little has been known about the wholesale destruction about to take place in Karahnjukar and other parts of the country. What could stop what poet Jokulsdottir describes as “a handful of men imposing their destructive dream on a nation which seems half-asleep”? in response to ‘Power Driven’. Susan De Muth’s article, Power Driven (November 29), has been circulating by email all around Iceland. It’s probable that an Icelandic journalist would have lost their job if he or she had been so outspoken. We desperately need international attention on the actions of our authorities. Your article is a step in the right direction. I am very much against this project too. This project is not about providing cheap energy for industry, it is about creating a civil engineering monument which will become a “white elephant”. 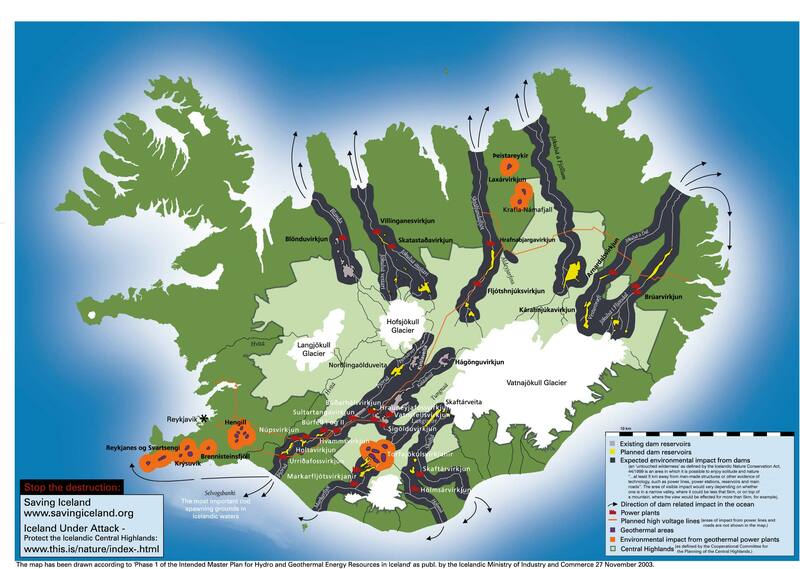 We all know that the energy could have been provided much more easily and quickly by bore holes, as has been recently proved once again in the Reykjanes peninsula. But, the Icelandic government wants this grand civil engineering project instead ! I have also heard recently that the tunnels they are boring through the mountains to provide the drain off’s to the generators have hit problems due to the strata along a fault line. This has meant that they can no longer tunnel in the impervious layer and are now having to concrete ahead of the tunnelling machine to provide an impervious layer!!! This means that the tunnel is going to be very much delayed and much more expensive and who will pick up the bill? It will be the Icelandic home owners whose electricity bills will soar in cost. What this shows is not only did Impregilo or Landsvirkjun not carry out a full environmental impact assessment, they also did not carry out a full geological survey. many years, you have my sympathy and support. … and I have a question. I read in the geological report which was produced in March 2005, that there is a relation between the geothermal heat and the faulting in the region which suggest that the fractures are more open and permeable. When I asked Sigurdur about the risk of a fault occuring underneath the Halson reservoir he told me that anyway the difference in pressure between the reservoir and the fault is not big enough because the water would have to travel too far and that the silt would probably clog the faults. Personnaly, this response doesn’t seem logical and I was wondering if anybody could enlighten me on this. The geological survey carried out was far from extensive. The research drilling was done along the roadside instead of close to the tunnelling sites. Therefore the geological sections were to a great extend unknown even though a simple geological surface mapping of fault lines could easily been carried out. Also there was a lack of geophysical data. Regarding volcanism and catastrophic flooding resulting from subglacial eruptions, all such evidence was intentionally omitted. Even the recharge of the Jökulsá river was miscalculated so that almost a 1/3 of the water is not used, leaving us with the chance of lowering the level of the reservoir by 20 meters. The tunnelling has taken a lot longer than expected and the cost is probably double. The permeability at the Halslon site was much greater due to the extensive micro and macro faulting. Some fault show displacement of up to meters (Saudardalur slip-strike) where as most are much smaller. The permeability at the dam site is obvious by a number of warm springs (Lindur, Saudarfoss etc) and geothermal waters were also encountered during drilling. Mr Arnalds is both right and wrong in his assumptions. Micro faults are likely to clog by glacial silt IF the increased pressure of the weight of the accumulated water in the reservoir does not cause subsidence and opening of faults, something that can result in a major hazard to the dam. Það dvergríki er líklega ekki til sem stjórnvöld geta ekki smækkað í augum umheimsins með háttalagi sínu. Hvað annað á að segja um þau viðbrögð ríkisstjórnarinnar við grein Susan de Muth í Guardian á dögunum að láta sendiherrann í London kvarta við ritstjóra blaðsins? Af hverju má blaðamaður sem skrifar undir nafni ekki hafa þá skoðun að tveir ráðherrar í ríkisstjórninni séu vanhæfir? Hvað kemur það lýðveldinu Íslandi við þótt blaðamaður telji að Siv Friðleifsdóttir hafi ekki næga þekkingu til að ákvarða hvað séu þolanleg umhverfisáhrif þegar Kárahnjúkavirkjun er annars vegar? Hverjir voru það sem útskýrðu ófarir sínar í atkvæðagreiðslum innan Alþjóðahvalveiðiráðsins með vanþekkingu ákveðinna erlendra ríkisstjórna? Var ekki Halldór Ásgrímsson í þeim hópi? Hvað með það þótt Susan de Muth hafi fengið það á tilfinninguna meðan hún dvaldist hér að Kolkrabbinn hafi gríðarleg ítök í íslensku viðskiptalífi, spilling viðgangist á Íslandi og Davíð Oddsson sé óvinsæll? Það er varla neitt sem er Íslendingum almennt framandi lýsing. Ýmsir myndu líklega helst kvarta yfir því að de Muth hafi ekki fengið nægilega haldgóðar upplýsingar um nýjar viðskiptablokkir sem gætu sjálfsagt keypt krabbann fyrir klink að eigin mati. Hvar var Óli Björn eiginlega þegar hans var mest þörf? Friðrik Sophusson getur verið stoltur af framlagi sínu og síns fyrirtækis til umræðunnar. Á heimasíðu Landsvirkjunar er dásamlegt fréttlíki þar sem segir að grein de Muth einkennist m.a. af dylgjum um „íslenskt samfélag eins og það leggur sig“. Sami Friðrik hefur blásið á fréttir af málaferlum á hendur vinum sínum í Impregilo vegna mútuhneykslis í Lesotho og Suður-Afríku með fullyrðingum um að mútur séu fastur liður í viðskiptum við Afríkumenn. Iss, þetta gerðum við nú til að pranga skreiðinni inn á Nígeríumenn í gamla daga, segir Friðrik, fullviss um að þannig hljóti það vera í allri Afríku enn í dag, rétt eins og mútur séu órjúfanlegur hluti menningar í heilli heimsálfu. Finnst nokkrum votta fyrir dylgjum í þessu? Kjökrið undan árásum hins ófyrirleitna lausapenna á „íslenskt samfélag“ er brjóstumkennanleg tilraun til að kynda upp þjóðrembu til varnar Kárahnjúkavirkjun. Það er sama eðlis og vælið í Davíð Oddssyni um vonda Falun Gong-fólkið sem ætlaði að neyta liðsmunar gegn „litla Íslandi“ í fyrra. Það er náskylt nostalgíuvaðlinum um vísindaveiðar á hvölum í sumar. Ef menn væru svona þrútnir af föðurlandsást þá myndu þeir tæplega eyðileggja hverja náttúruperluna eftir aðra, koma Íslandi í heimsfréttir með fangabúðum í Njarðvík og gera sig að viðundrum með því að siga sendiherranum í London á ritstjóra Guardian. Eða hvað? Þetta blogg frá Akureyrardeild Samfylkingarinnar um grein Susan DeMuth finnst mér að þurfi að halda til haga því óneitanlega er það sögulegt.